Berry Radical Antioxidant Superfood is now availiable for purchase in a triple pack!! Fantastic news! If you take advantage and purchase you will also automatically qualify to become a lifestyle member of Miessence which will entitle you to a 20% discount on all future orders. Berry Radical makes a delicious chocolatety beverage enjoyed anytime of the day and its so good for you packed full of 9 antioxidant rich superfoods. For more information click here. outside via tobacco smoke, toxins, pollutants and sub-optimal eating habits. Free radicals are believed to accelerate the progression of many diseases. impact antioxidant activity in the body and reduce free radical damage.*1. units. One 3.5g teaspoon serving of Berry Radical contains over 4000 ORAC units! One 105g tub contains 123,375 ORAC units. Contain anti-inflammatory antioxidants and bone-friendly boron and magnesium. Eating 100g of apple provides the same antioxidant benefits for inflamed joints as 1500mg vitamin c. Wash but don’t peel your apples the antioxidants are five times more concentrated in the skin than the flesh. Contains antioxidant monounsaturated oils, essential fatty acids, beta-sitosterol and vitamin E. Avocado can suppress joint inflammation by reducing production of inflammatory substances. It promotes cartilage repair in osteoarthritis by stimulating the activity of bone-building cells and cartilage cells. The richest dietary source of selenium – a single Brazil nut contains around 50mcg. Selenium improves the quality of cartilage proteins. Also good source of magnesium and sulphur. People with the highest dietary intake of selenium are least likely to develop osteoarthritis. Each increase of 0.1 parts per million of selenium in your toenail clippings ( a good indicator of selenium status) lowers your risk of knee osteoarthritis by 20 percent. Contains substances called capsaicin and dihydrocapsaicin. Capsaicin and dihydrocapsaicin block transmission of pain messages. They also trigger the release of endorphins – the brains own morphine-like painkillers. Capsaicin is used in clinical trials as a long acting analgesic to treat post-surgical and osteoarthritis pain – a single injection at the site of pain acts for several months. For example, anise, chilli, cloves, cumin, fennel, ginger, mustard and turmeric. Curry spices have an anti-inflammatory, pain killing action that helps to alleviate joint symptoms. Mustard isothiocyanates reduce inflammation in a similar way to aspirin. Turmeric and ginger contain curcumin, which may reduce cartilage destruction in osteoarthritis, and prevent the onset of rheumatoid arthritis. For example broccoli, spinach, spring greens, dark green cabbage and parsley. These vegetables supply antioxidant carotenoids, vitamin C, calcium and magnesium. 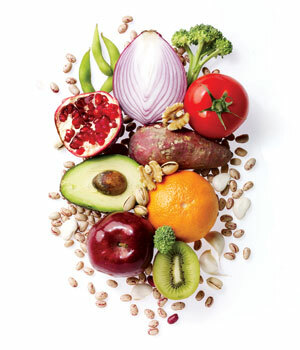 A high antioxidant diet is good for arthritis. Sixty-one percent of the bone-friendly calcium found in broccoli is absorbed from the gut, compared to 32 percent of calcium in milk. Inliven contains broccoli, spinach and cabbage and Deep green contains kale, collard greens and lots of grass juices. For example cherries, grapes, blueberries, bilberries, dark raspberries and elderberries. These contain antioxidant anthocyanins which lower levels of inflammatory chemicals in the body. Eating 250g of black cherries daily can lower uric acid levels enough to prevent gout. Drinking a glass of red grape juice has an antioxidant action that lasts for two hours after ingestion. As the name suggests Berry Radical has a variety of berries packed in, including acai berry, raspberry, blueberry, strawberry. Contains beneficial substances such as allicin. A Russian study has shown that people with rheumatoid arthritis can benefit from increasing the amount of garlic they eat. Contains vitamin C and antioxidant bioflavonoids. Red grapefruit has a higher antioxidant content than yellow grapefruit. Grapefruit helps to reduce inflammation, strengthen cartilage and block prostaglandins (substances involved in pain). It increase the anti-inflammatory effect of some painkillers. Eating grapefruit regularly improves symptoms in some people with rheumatoid and other forms of inflammatory arthritis. The richest food source of monounsaturated fatty acids and an excellent source of vitamin E and selenium. The antioxidant action reduces inflammation in arthritis. The nuts are being used in a trial to reduce the risk of rheumatoid arthritis. Cathedral Cove Macadamias has a great range of macadamia products. A rich source of anti-inflammatory omega-3 fatty acids (EPA and DHA). A large analysis of 17 studies assessing the pain-relieving effects of omega-3 fatty acids in rheumatoid and other autoimmune forms of arthritis showed they significantly reduce joint pain and intensity, the duration of morning stiffness, the number of painful joints and the need to take NSAID painkillers – all within three to four months. A rich source of monounsaturated fats and antioxidant, anti-inflammatory substances. Increased olive oil consumption is associated with a reduced risk of rheumatoid arthritis and cardiovascular disease. Olive oil may protect against the development of osteoarthritis. A rich source of quercetin – an antioxidant bioflavonoid that suppresses the production of inflammatory substances. Red onions are particularly high in antioxidants. Quercetin binds to cartilage and strengthens its structure. As an antioxidant it mops up free radicals within joints and reduces the release of protein-degrading enzymes. A rich source of antioxidant polyphenols, anthocyanins, vitamins C and E and carotenoids. Just one of the fantastic ingredients in Berry Radical. Its antioxidant potential is two or three times higher than that of red wine and green tea. Ellagic acid in pomegranate juice reduces inflammation by blocking activation of inflammatory substances that play a key role in cartilage degradation in osteoarthritis. A rich source of antioxidant polyphenols such as resveratrol. Resveratrol blocks the release of inflammatory substances, which helps to reduce joint inflammation. White, green, oolong and black tea contain high levels of antioxidant catechins, such as epigallocatechin-3-gallate (EGCG). EGCG inhibits the expression of inflammatory mediators in arthritic joints and helps to protect cartilage degradation in osteoarthritis. A rich source of omega-3 fatty acids. Omega-3 fatty acids have an anti-inflammatory action. Some research shows that eating walnuts daily can help alleviate the symptoms of rheumatoid arthritis. For example carrots, sweet potatoes, guava, mango and pumpkin – these are all rich sources of vitamin C and antioxidant carotenoids. Fruit and vegetables with high antioxidant content can reduce pain and inflammation in all types of arthritis. Contains probiotic bacteria. Probiotic bacteria help to reduce the severity of joint inflammation. They also reduce abnormal intestinal bacterial balance (dysbiosis) associated with ‘leakiness’ of the gut wall and food intolerance. Inliven is packed full of probiotics or try the gluten-free Fast-tract which is even more abundant in the good bacteria.